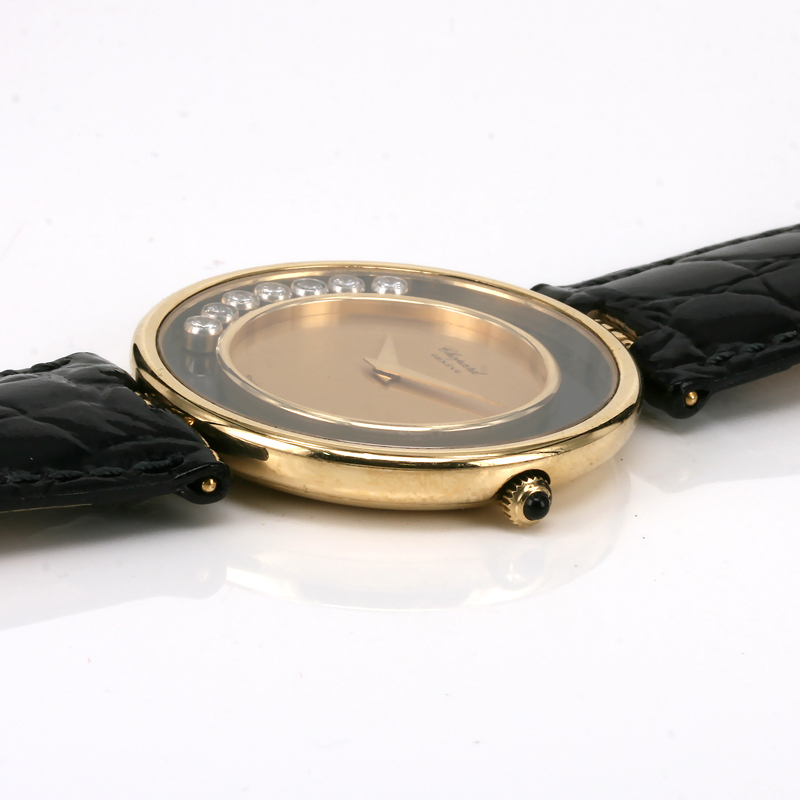 Product code: ES2735 Categories: Sold Items, Sold Watches. Chopard watches was formed in Switzerland in 1860 and since then has made a name as one of the finest Swiss watch companies in the world and here is the iconic Chopard Happy Diamond watch reference G 2466. First created in 1976, the Chopard Happy Diamond watch became a worldwide success and allowed the diamonds to move freely around the watch as it does in this one here. Made in 18ct yellow gold, the case measures 33.4mm across plus the crown and has the champagne coloured dial and black outer edge that really shows off the diamonds at their best. There are seven diamonds in total that move so freely when the watch is worn and really makes it such a talking point and truly is like no other watch. Inside is a manual wind movement that has just been completely serviced and overhauled, runs perfectly and comes with our twelve month warranty. The Chopard Happy Diamond series watch is still being made today and is a true testament to such a unique and eye catching styling that has never gone out of date.